If you have long rooms then the rectangular dining tables will be the right choice. Depending on shapes and sizes; these tables can accommodate more seats and still leave enough space into a room. Contemporary style and traditional value go hand-in-hand with this exquisite and versatile Avery Dining Table by Andover Mills. This trendy dining table features a refined touch engineered wood top with attractive ash-gray finish and stunning bronze powder-coated metal base with beautifully designed spindle legs. Engineered wood top with Ash-Gray finish veneer. Dark bronze powder-coated metal base. Slick and classy spindle fashioned four legs. Can fit up to 6 dining chairs easily. Use a dry microfiber cloth for cleaning the surface. Impress your guests with this classy and elegant Astor Dining Table which features smooth walnut finish and polished stainless steel base with chrome finish. Its ideal automatic mechanism to smoothly glides the table tops and align the center leaf perfectly makes it’s the smart choice to solve all your space related issues. Now bring home this gorgeous dining table and invite as many guests as you like because this attractive yet sturdy table will easily extend from medium size of 71” table surface with seating capacity of 8 to extra-large size table of 94” with seating capacity of 10. Comfortable and stylish Delancy Side Chairs (sold separately) will compliment your dining table and enhance the décor of your dining room. Constructed from MDF and real wood veneers. Smooth Walnut finish 4″ thick table top. Also available in Wenge finish and White Lacquer finish. Chrome finish, polished stainless steel base. Self-storing leaf which extends this medium size table of 71” with seating capacity of 8 to extra-large size table of 94” with seating capacity of 10. Automatic center extension leaf is revealed when table top is extended. Automatic system ensures that both tops glide smoothly for perfect alignment every time. The clearance under the table is 26″. 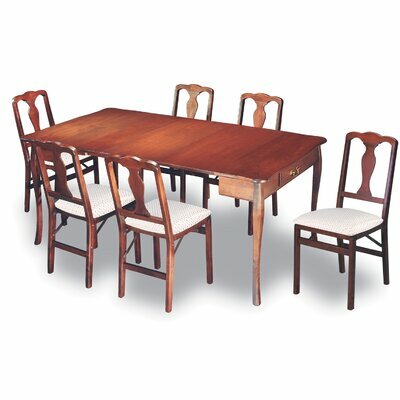 Elegant Coventry Dining Table with classy country style will brighten up our dining room or kitchen space. This is a totally functional yet statement piece which is sturdy and durable and will stand the wear and tear of many years to come. Pair this stylish table with beautifully fashioned and comfortable matching arm chairs. Constructed from hackberry hardwood, solid birch hardwood and ash veneer. Appealing combination of weathered driftwood and Dover white finishes. Extend your dining table surface from 66” to 84”. Dover white table base with classy shaped legs. 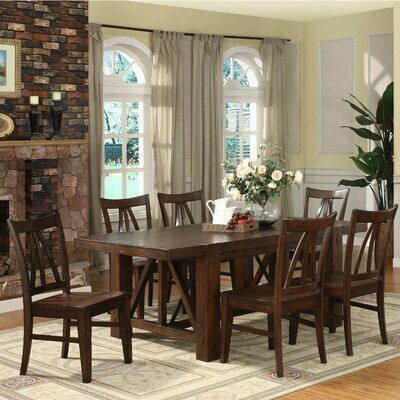 As the name suggests, Traditional Expanding Dining Table features a traditionally designed warm cherry finish expandable table top with two leaves which expand the table space to easily accommodate 6 diners. This is a multifunctional versatile piece of furniture which can be used as both console or sofa table and game table just by pulling out the back legs and flipping the hinged table top. Made from premium solid wood with veneer top. Traditional style table with Warm Cherry finish. Two leaves to extend table surface to 72”. Pull out back legs and flip the table top to transform to a game table. 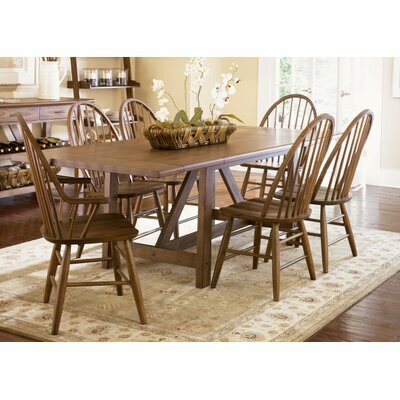 Fantastic and appealing Castlewood Dining Table features a walnut hardwood tobacco finish table top with two large cross beam fashioned legs to further enhance the décor of your kitchen or dining area. Rich and warm Tobacco finish. Beautifully designed rectangular shaped table. Two cross beam fashioned large legs. Distressed Walnut hardwood solid top with walnut veneers and metal angle brackets. Aesthetically pleasing and simple design with modern sophisticated feel makes Capri Dining Table the right choice for your kitchen or dining room. 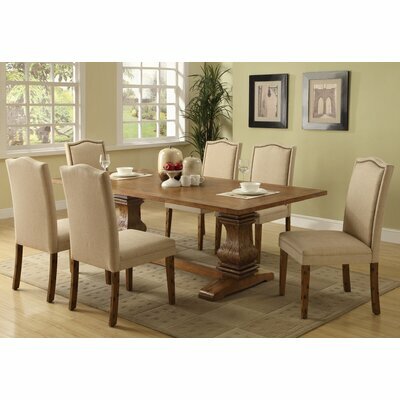 This fantastic and sturdy dining table features rich Cappuccino finish table top and four straight legs. Constructed from sturdy and durable Asian solid wood. Stylish rectangular shaped table top with four straight legs. Matching side chairs and comfortable bench available (sold separately). Give warm inviting touch to your interior décor with attractive feel and rich color of Ashley Willow Dining Table. 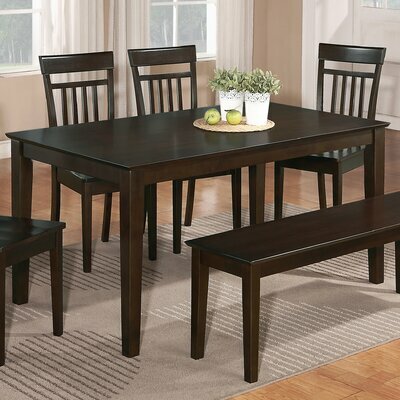 This appealing rectangular shaped dining table features rich burnished dark brown wood finish table top and base with two substantial taper legs. Attractive Rich Burnished Dark Brown wood finish. Thick built-up edged table top. Two-sided taper shaped massive legs. Assembled in the USA with global components. Stunningly elegant and distinctively sophisticated Randall Dining Table gives you a pleasurably warm and inviting dining experience. Classy traditional design and sophisticated trendy look go hand-in-hand with this gorgeous looking dining table. Your guests will surely praise your perfect choice! Constructed from engineered hardwood and poplar veneers. Transitional style table with Coffee finish. Bold and stylish pedestal base with gentle curves and distressed look. Simply elegant and sturdy counter height Tavern Dining Table occupies less space and offers more functionality to your kitchen, dinette or dining area. This table is super easy to assemble and features modern style three step hand-crafted finish and unique worn looking legs with plastic gliders. Contemporary style and three step hand-crafted finish. Unique worn look with smooth rubbed edges. Sturdy table with plastic gliders on legs. Can fit 4 chairs easily. Use dry cloth for cleaning. 30 days warranty against defects. 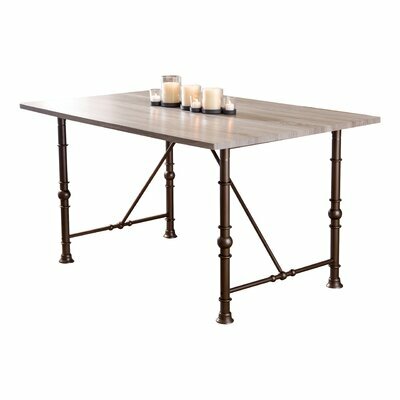 Casual yet decently elegant Farmhouse Casual Dining Table features weathered oak finish table top with rustic look; a cross beam fashioned central base with two large legs and; two leaves to extend table space to 102”. 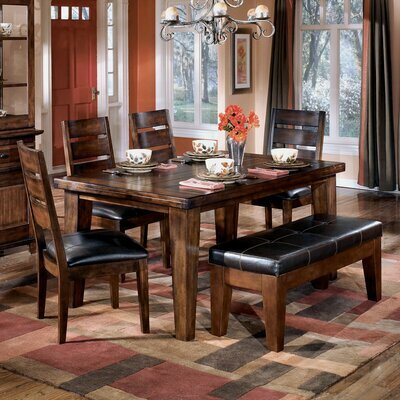 Bring the fresh and casual feel of farmhouse with this spacious dining table for your everyday dining experience. It is one of the Farmhouse Casual Dining collection. It is made from hardwoods and pine knotty oak veneers. Classy Weathered Oak finish with rustic look. Leaves extend table top surface to 102”. Each leaf is 18” wide.